Former 185-pound top contender Nate Marquardt was set to face Yoshihiro Akiyama until the unfortunate earthquake and tsunami forced the Japanese judoka off UFC 128. The show must go on, as Dan Miller gladly stepped in for Akiyama in hopes of leapfrogging a few notches up the middleweight ladder. Nate “The Great” failed to live up to the billing in his last outing at UFC 122. Marquardt saw another title shot slip through his hands when Yushin Okami dominated him for a unanimous decision win. While Marquardt came out more aggressive than in fights prior, I hear getting dubbed a “choker” by your boss will often have the effect, he wasn’t able to finish off the last-minute substitute. After 15 hard-fought minutes, Marquardt was forced to settle for a lopsided (30-27, All Three Judges) unanimous decision victory. “I feel really invigorated after this victory. 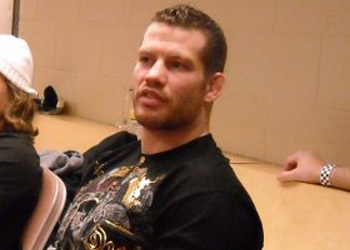 I wanted to go out and show how I’m the new Nate Marquardt,” stated Marquardt. Most fighters get cut by UFC brass after three-straight losses, but Miller got a second lease on his Octagon life and has rewarded his boss with back-to-back wins heading into Saturday night’s affair. He’s surely in the UFC’s good graces after subbing in at the 11th hour. “I didn’t think Miller was as quick as he was and then we started the fight and I realized I needed to be at the top of my game to beat him. I had to shoot at his chest for the takedown because I knew how dangerous he was with the guillotine,” the Colorado native said of his last-minute opponent.